I always talk about the women in my family. 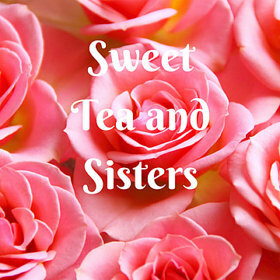 The title of my blog and big inspiration for my jewelry is the relationship between me and the women in my family. I have and have had such strong female role models all throughout both sides of my family. My sweetest memories are sitting around a table or a den with these women and learning and taking in their best qualities. I learned to be independent and confident in my opinions because I had a "safe" place to express them. I am always talking about the women, but I have been blessed with just as many strong men. It's sometimes confused that a woman can't be independent and have respect for men. I think that is really the idea in today's world. I was raised by men who taught me to speak up for myself. I was the first grandchild on both sides and I have just never had the idea I couldn't do something just because I am a girl. I am so thankful and blessed for the men I have and have had in my life. My kids don't have a relationship with their dad or his side so I am even more so thankful that they have had these men to look up to and learn from. One of the special men is my "little" brother. He is 7 years younger than me but has always managed to take care of me as if he were a big brother. Looking back at what at the time seemed like aggravating little brother stuff like telling on me was usually for my own good. I just didn't see it until I got older. He has filled in for my kids. He's their uncle, but also their godfather. He has twin boys who will soon be 15 and a little girl who is 8. It's so funny when you see your siblings in your own kids. My youngest is so much like my brother. He is smart, thinks like him, and even looks a little like him. He has certain mannerisms that are like flashbacks of my brother at his age. I see a lot of me in his little girl. She likes to wear comfortable things and doesn't like to fuss with her hair. I still only like comfortable clothes, but when I was little I didn't like to wear anything in my hair either. My mom would put barretts in my hair in elementary school and I would take them out when I got to school and put them back in when it was time to go home. I thought I was so clever......until the yearbook came out......with candid shots of me.........without my barretts! Today is my little brother's birthday and I couldn't be more proud of him as a man, father, and husband. He has always had such a strong faith and it shows in everything he does and the way he lives his life. I am so thankful for him and to him for still taking care of me when I need it! As one of my mom's favorite sayings goes, "Not a lot has changed!" He did go through a phase when he thought it was funny to give the bird. This photo is from the 80's with him doing just that. Around the time this picture was taken he was in my car with me. I was in high school and pulled up to a red light next to a really "hot" guy from a local high school. We had similar cars and he was trying to race, but my little brother was on his side in the passenger seat and took it as flirting. In his protective little brother way, he kindly looked over and gave the guy the bird. AND...... I was humiliated, but couldn't help laughing at the same time! 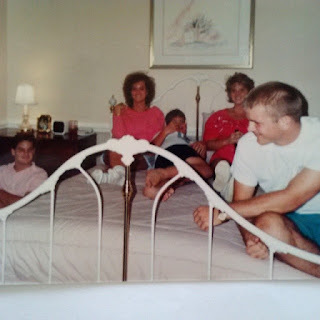 My brother in the middle, sister and her husband now (high school sweetheart then) on the left. A good friend of ours is in front of me. His son and my son are good friends. I think this may be why I love the show The Goldbergs so much. That boy can remind me of my brother at times. 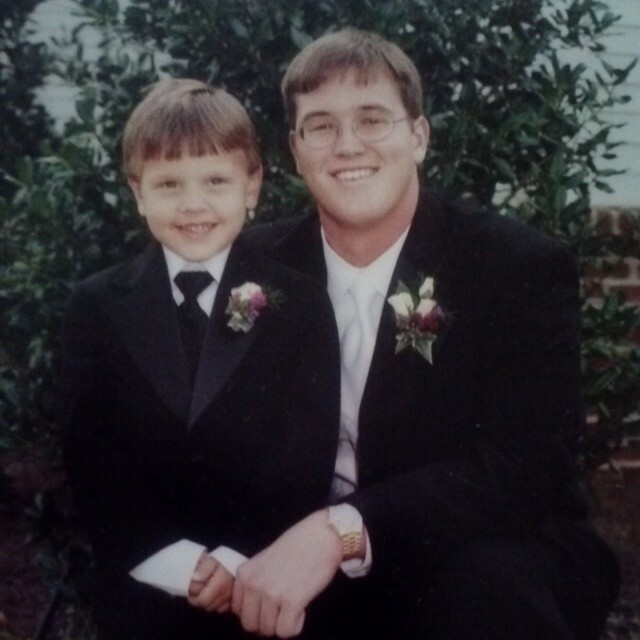 This is one of my favorite pictures of him on his wedding day with my older son who was ring bearer.